Optional Single Supplement: $580 USD (number of singles limited). 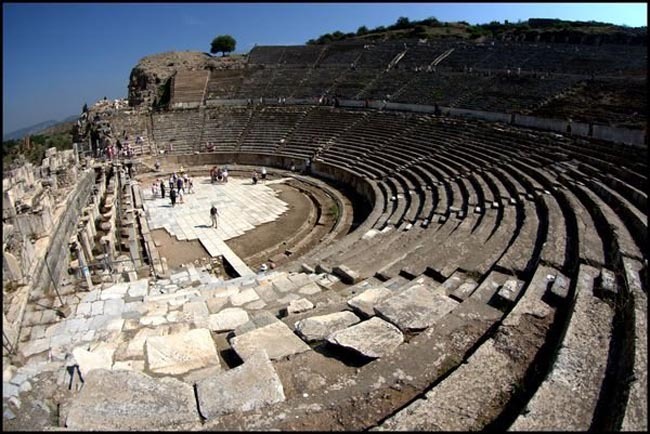 On this Western Turkey Tour, we will have the chance to step inside the great Hippodrome, a massive sports stadium where the chariot races of ancient Roman and Byzantium times can easily be imagined. Visit Izmir, the birthplace of the legendary poet Homer and Turkey's most important port. Travelling along the Taurus Mountains we reach the Mediterranean coast where the waters are an exceptional shade of blue, a feature that gave raise to its moniker of "The Turquoise Coast." Experience rural life as we pass through the countryside of Turkey and see the lush wheat fields and orchards. The Cappadocia area holds marvellous lunar landscape where churches have been carved and volcanic dust has been weathered into large cones. We can wander the tunnels and chambers of an entire underground city dug into the Cappadocia in which citizens took shelter during times of strife. I enjoyed the Blue Mosque, St. Sophia, Troy, Pergamon, Ephesus, the Crusader Castle of Bodrum, the gulet cruise, Cappadocia/Goreme Valley, the hot air balloon ride option, the Museum of Anatolian Civilizations, Topkapi - an incredible array of sites and an amazing learning experience about Turkey. The food exceeded my expectations. I liked that it was authentically Turkish. Our tour leader Yasemin was authentic, knowledgeable, patient and fun. Yasemin is the best tour leader I ve ever experienced, having taken three tours with other companies to Egypt, Jordan and Mexico. She dealt with both the logistics of the tour and all the site interpretation, handling both superbly. She answered questions far beyond the scope of the tour, discussed current events knowledgeably and gave us real insight into Turkey. She s fantastic! Excellent tour! Yasmin has a unique blend of experience , knowledge & organizational skills. She knows when to be flexible & when to be tough. This was a large group & she managed all the varied personalities/needs very well. Love her sense of humor & her willingness to discuss, share & educate. Highlights for me were the day on the boat, the ballooning in Cappadocia, the sites of Ephesus & Pergamon, The Dardanelles. The great mosques in Istanbul were essemtial to see.The whole Tuquoise coast was amazing especially Bodrum. She (Yasmin) is a five star leader/guide. I would do this tour again in a heartbeat. Very enjoyable trip with nice group of 12. I most enjoyed Ephesis, Kas, Bodrum, Myra, Konya and Cappadocia - Dervishes. Our bus driver was wonderful. Our tour leader was very personable and kind with excellent local knowledge. Yasmin is the most outstanding tour leader I have had. She not only has vast historical and cultural knowledge and, therefore, serves as the local guide for each site, she also has the organizational skills to run the operational side of a tour. Today we arrive in Istanbul and transfer to our hotel. "If one had but a single glance to give the world, one should gaze on Constantinople," marveled Alphonse de Lamartine, the 19th century French writer and politician. New Rome, Byzantium, Constantinople, Istanbul; the legendary city has served as the capital of the legendary Roman, Byzantine and Ottoman Empires. Though no longer a capital, Istanbul is the largest city and the cosmopolitan heart of Turkey, full of marvels and startling contrasts. 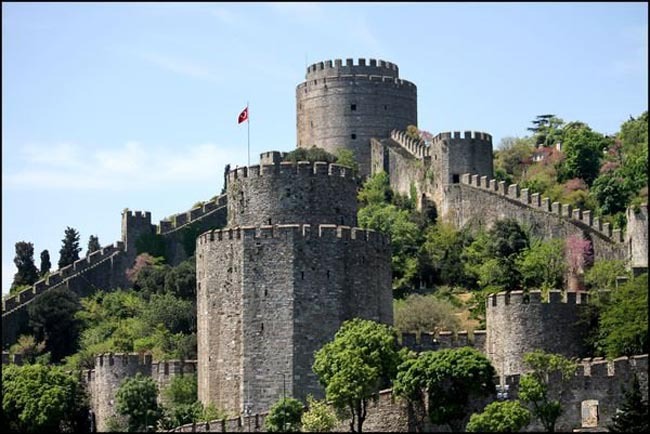 We start our day with a panoramic drive around the Golden Horn and the great walls of Constantinople. The first recorded bridge over the Golden Horn was built during the reign of Justinian the Great in the 6th century at the western end of the city, and today we will pass the famous Galata Bridge and the Ataturk Bridge. As we drive along the Byzantine city gates and walls we will view the towering minarets of Suleyman's Mosque and the Galata Tower before arriving in Sultanahmet Square. We'll begin the walking component of today's tour at the legendary Blue Mosque, built between 1609 and 1616 by Mehmet Aga. The inside is covered by more than 20,000 Iznik tiles. At the adjacent Hippodrome you will see the remains of the great sports stadium where chariot races were held in Roman and Byzantine times. We will also see an Egyptian obelisk, a giant needle of stone carved for the Pharaoh Tutmoses III around 1500 BC and brought to Constantinople by the Byzantine Emperor Theodosius in AD 390. We continue to the church of Agia Sophia (St Sophia), built by the Emperor Justinian in 548 BC. It was the largest church in the Christian world for nearly 1,000 years. When the Ottoman Turks conquered the city in 1435 one of the first things they did was to convert St Sophia into a mosque. Today it is a museum featuring many beautiful Christian mosaics. Outside Agia Sophia we descend underground to the gigantic Basilica Cisterns. These are the largest of several hundred ancient cisterns that lie beneath the city of Istanbul. Like most sites in Istanbul, the cistern has a colourful history. Constructed using columns, capitals and plinths from ruined buildings, the cistern's symmetry and sheer grandeur of conception are quite extraordinary. This immense underground water container was built during the reign of Emperor Justinian I in 532 to meet the water needs of the Great Palace. This marvelous piece of engineering only confirms yet again that those were the heydays of the Byzantine Empire. At the end of our touring today your Tour Leader will lead you on a leisurely exploration of Istanbul's famous Grand Bazaar before setting you free for independent exploration. After breakfast we drive along the Sea of Marmara through the small European part of Turkey known as Thrace. Only 3% of Turkey is in Europe, the other 97% known as Anatolia, is in Asia. One of the fascinations of Turkey is the huge number of peoples and empires that have occupied this land. Before leaving Europe we visit Gallipoli, Gelibolu in Turkish. This narrow, mountainous peninsula on the northwestern side of the Dardanelles has seen more than its share of history with countless civilizations having battled for control over these straits for over 3,000 years. This is the historic World War I battleground where Mustafa Kemal Ataturk, father of the Turkish Republic, first rose to prominence. Under the direction of Winston Churchill, an unsuccessful naval and land campaign failed in its attempt to capture Gallipoli, open up the Dardanelles, and seize Constantinople. This battleground is now marked with over 30 memorials. We then cross the Dardanelles waterway by ferry from Europe to Asia where we visit the ruins of Troy where Greek and Trojan heroes fought for the beautiful Helen. Troy had been accepted as a lengendary city for ages, but very few people believed in its true existence. Heinrich Schliemann excavated here at this own expense in the 1870s and discovered the spot where a sophisticated settlement had existed for centuries. As you stand on the ancient hilltop you can look out over the plain of Troy and feel the famous cool north wind blowing from the Dardanelles. We arrive in Canakkale in time for dinner. We have an early start today, travelling down the rugged Aegean coast and inland to the typically Turkish rural town of Bergama. Here we visit the Akropolis and Asklepion of the Roman city of Pergamon, said to be one of the first hospitals in the world. We see a carving of two snakes wrapped around a drinking cup (a modern symbol of the medical profession), and a theatre where the mentally disturbed would allegedly act out their emotions (a forerunner of today's psychoanalysis?). Later we travel through Izmir, Turkey's most important port. Here the blind poet Homer was born when the city was known as Smyrna. Also here in 1922 the Turks expelled the invading Greeks from Turkish soil during the Turkish War of Independence. We continue to Kusadasi, a beautiful port city with a small island fortress. The island, attached to the mainland, gives the city its name: Kusadasi, "The Island of Birds." 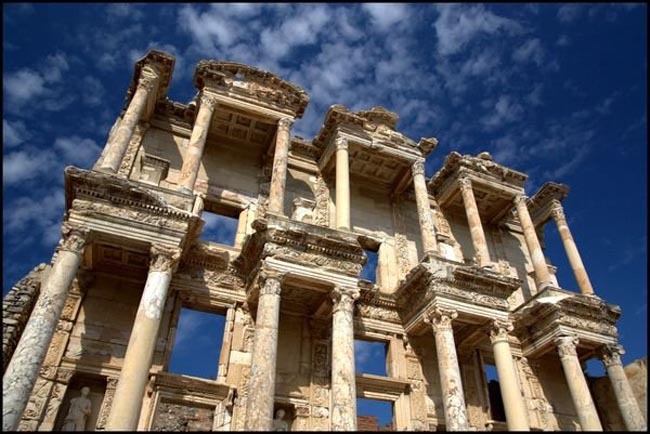 Today we visit Ephesus, one of the highlights of any visit to Turkey. During its Golden Age, the city was adorned with splendid monuments, theatres, agoras and libraries. The protectress of the city was the goddess Artemis whose temple, dating back to 1300 BC, was considered one of the Seven Wonders of the World. 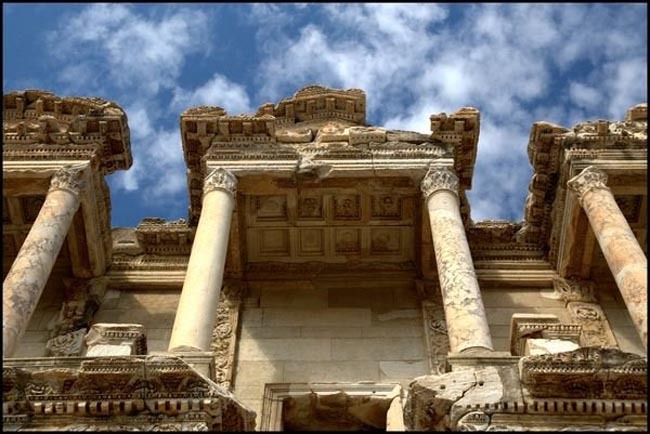 As a prosperous trade and banking centre, Ephesus had a cosmopolitan population. It has been recorded that St John brought the Virgin Mary to Ephesus where she spent her last days after the death of Christ. On our tour of Ephesus we see a 24,000 seat amphitheatre, the Library of Celsus, and the marble-paved Arcadian Way. We also include the special Terrace Houses section, which provides fascinating insight into family life during the Roman period. In addition to the main site of Ephesus we will visit the superb Ephesus Museum. We also visit the traditional town of Selcuk with its many beautiful buildings, including the Isa Bey Mosque (built in 1307), remains of old Turkish baths, and a hill crowned by the Ayasoluk Fortress. Today we travel southward along the Aegean coast on winding roads through fields and olive groves to Bodrum. En route we stop at Didyma, an ancient Ionian shrine and the most renowned oracle of the Hellenic world, containing a temple and an oracle of Apollo. The Temple of Apollo at Didyma was the fourth largest temple in the ancient Greek world. This afternoon we visit the Crusader Castle of St Peter, which dominates Bodrum Bay. The castle was built by the Knights Hospitaller in the early 15th century. Today the castle houses an excellent museum, mainly dedicated to the artifacts retrieved from the many ancient shipwrecks discovered off the Turkish coast. Many of the pieces in the museum have been excavated from below the sea bed by teams of archaeologists from Texas A&M University. Today is free for you to enjoy the ambience of this beautiful seaside town. Some may want to explore the Bodrum Mausoleum, also known as Mausoleum of Halicarnassus -- one of the seven wonders of the ancient world. The Mausoleum dates back to 350 B.C. and is dedicated to Carian satrap Mausolus. This monument tomb was 50 meters high, and rose over the region. Though there is not much left to see, the site is worth a visit with its beautiful ruins, gardens and landscape. Situated on a hillside overlooking Bodrum is the Bodrum Amphitheatre, another structure accredited to the reign of King Mausolus. The theatre is another witness to the great past of Bodrum, and it is one of the best-preserved structures of ancient Halikarnassus. Originally, it was built around 4th C BC during the reign of King Mausolos, in 2nd C AD, during the Roman period, it was enlarged and enriched. Leaving Bodrum we head over the coastal fringes of the Taurus Mountains to the warm Mediterranean coast, called the 'Turquoise Coast' because of the exquisite blueness of the sea. The picturesque fishing village of Kas has a quaint harbour, carved tombs in the mountain behind, an ancient Lycian amphitheatre, a Lycian tomb, and the Greek island of Kastellorizo just off shore. Today we cruise the Mediterranean on a wooden yacht, relaxing, sun bathing and stopping to swim at leisure. Our itinerary is open-ended today in order to account for local weather conditions, though our likely itinerary will include Tersane, Kekova submerged ruins, and the fortress at Simena. At some of these sites, foundations of houses and rock hewn staircases with outlines of buildings can be seen almost at the water's surface. There are several excellent places to moor for swimming and sightseeing. Today we travel along the Lycian Coast visiting the rock tombs of Myra and the Church of St Nicholas -- the original Father Christmas -- on the way to Antalya. Before reaching Antalya we stop at Phaselis, one of the mst spectacular Roman cities on the coast, located on a narrow peninsula between pine forests and three natural harbours. We visit the vast Roman site of Perge where St Paul is said to have preached his first sermon. Here are the ruins of a huge theatre with impressive marble relief work, fountains, a colonnaded steam bath and basilica. Nearby is the well preserved amphitheatre at Aspendos, which the Romans designed so brilliantly that natural acoustics allow someone sitting in the furthest seats to hear a person speaking in a normal voice down in the orchestra area. We will also see the aqueduct that brought water from the mountains to the city. We return to Antalya and visit the excellent museum containing early Christian icons and Roman tombs with some of the best examples of Roman sculpture of Asia Minor. We climb inland through dramatic scenery to the Anatolian Plateau. Agriculturally, Turkey is one of the richest countries in the world. As we drive past villages and farms we see an abundance of wheat fields and orchards. Turkey is a huge exporter of dried fruits such as apricots and figs as well as nuts, lentils and beans. We take a scenic route to Konya through the Taurus Mountains via Side. Once the trysting place of Anthony and Cleopatra, Side stands on a promontory flanked by two excellent beaches of golden sand. The ruins of the ancient city mingle with the new, and despite its development as a resort, it retains its own very special atmosphere and charm. Later we arrive in Konya, a very traditional town and a religious centre where Mevlana Rumi founded the Whirling Dervishes in the 13th century. Here he taught a mystical branch of Islam which still has a strong influence around the world today. We visit the museum and tomb of the Mevlana, one of the holiest places in Turkey for Muslim pilgrims. Konya was the centre of Sultanate of Rum from AD 1150 until 1300. Many of the great buildings of Konya are Seljuk in design and date from this 'Golden Age'. We will see the ruins of the Seljuk Palace, the Karatay Museum and the delicate stone carving of the Slender Minaret. Today we drive across the flat Anatolian Plateau to Cappadocia. Along the way we visit the caravanserai of Sultanhani. Caravanserai were fortified, medieval inns located one day's journey apart, for the protection of travelling merchants. This encouraged merchants and their caravans of silks and spices travelling the "Silk Route" to trade in Turkish lands, thus promoting commerce. Today we will spend a full day exploring this unique and fascinating lunar landscape with its fairy chimneys and conical towers topped with huge, delicately balanced rocks. Here the elements have weathered layers of volcanic dust into giant cones and mushrooms 9m (30 feet) high! Most of the chapels date from the Byzantine period of the 10th and 11th centuries. In the Goreme Valley we will see the many churches carved into this landscape with their wonderful paintings and frescoes. This monastic complex of rock chapels covered with frescoes is one of the best known sites in Central Anatolia. 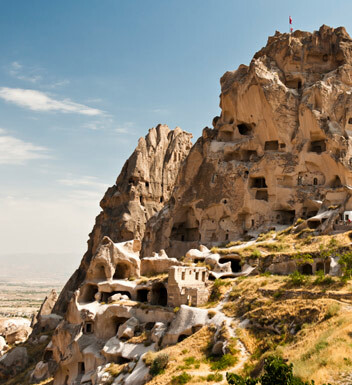 We will visit the underground city of Kaymakli one of the many cities dug into the soft rock of Cappadocia. At Kaymakli there are at least eight levels in the underground city, four of which are currently open to the public. The city is an elaborate network of tunnels, stairways and chambers hollowed out of the rock. It served as a safe haven during times of unrest and protected its citizens from marauding armies. This evening, those who wish may attend a performance of Turkish traditional dances from Turkey's many regions (optional). Our drive today takes us to a salt lake called Tuz Golu. We travel through the village of Uchisar, clustered around the Uchisar Fortress, and the village of Urgup which was, according to documents found in the Middle Ages, a bishop's residence. We continue to Ankara, Turkey's modern capital. Ankara was an ancient trading town before the Romans arrived; its name is derived from the angora wool of the goats sold here. Ataturk, founder of the Turkish Republic, made Ankara the capital rather than Istanbul to break with the discredited Ottoman Empire after World War I. 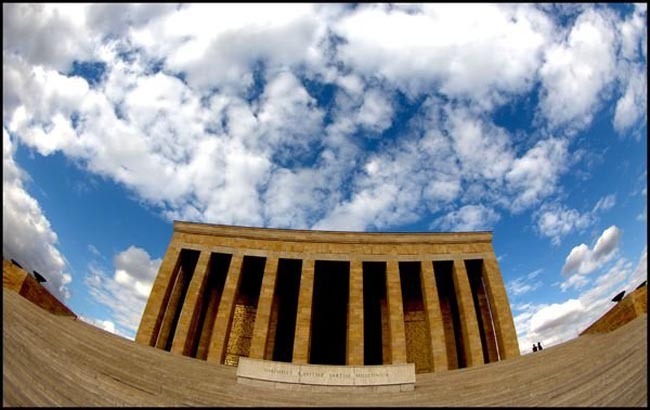 We visit the Mausoleum of Ataturk before our visit to one of the best museums in the world -- the Museum of Anatolian Civilizations. The museum contains a superb collection dating back to the settlement at Catal Huyuk in 7500 BC and includes pieces from the Phrygian, Urartian, Assyrian and mighty Hittite Empires. Today we travel to Istanbul via high-speed train (3.5 hours). Istanbul straddles the confluence of two waterways, the Golden Horn and the Bosphorous. The city is divided by these waterways into three parts. Two parts are in Europe and one part is in Asia, making Istanbul the only city in the world spread over two continents! The city is crowded with beautiful mosques, churches and palaces. You can stroll through the Grand Bazaar, one of the oldest covered marketplaces in the world containing over 4,000 shops where virtually anything can be bought. We recommend an optional cruise on the Bosphorus, the natural gateway that divides Asia and Europe. As you sit back and may enjoy tea from traditional small cups, numerous summer palaces and palatial homes will pass by on either side. Your Tour Leader can assist in making these arrangements. Today we visit Topkapi Palace, the great palace of the Ottoman sultans from the mid-fifteenth to the early nineteenth century. It was from this vast complex of buildings that the mighty Ottoman Empire was organised. Today it is a huge museum containing ceremonial robes in silk and gold thread, Japanese and Chinese porcelain, European clocks, miniature paintings depicting Ottoman courtly life and one of the largest jewelry collections in the world. You may choose to end your visit with a look at the Topkapi Harem, where the sultans' many "wives" were kept in isolated splendour, before leaving the palace (optional entrance fee). Balance of the day at leisure; your Tour Tour Leader can help you plan your day. 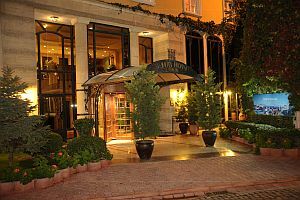 Hotel Arcadia Blue, is located on a central but calm street at the district of Sultanahmet, that is the cultural ...	commercial heart of Istanbul; In face of the previous Courthouse of Istanbul. The Antique Theatre Hotel caters to those who seek the sophisticated refuge of a small elegant hotel with professional and ...	personalized service. Antique jars in the flowery gardens, original etchings, hand-made bed spreads, antique mirrors and chairs in the guest rooms, the ottoman screen and the porcelain collection in the restaurant add to the sophisticated atmosphere. All rooms equipped with air conditioning, shower and toilet, direct telephone. Large outdoor swimming pool, safe deposit boxes, easy access to the beach. The Marina Hotel has been restored into a posh Ottoman dream of comforts, from its courtyard swimming pool to the ...	rooms, all done in late Ottoman decor. It is situated in Antalya, right in the Old Town city centre. The hotel is one of the most atmospheric places in Antalya, especially because of its wonderful location and architecture of the ancient Mediterranean style. Rooms feature air-conditioning, telephone, minibar, TV. 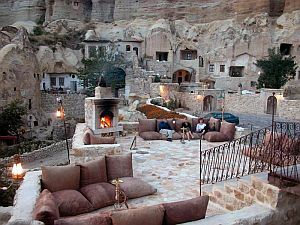 In Cappadocia’s magical landscape of fairy chimneys, in the ancient village of Urgup, is a unique cave hotel carved into ...	mountain cliff, the Yunak Evleri. 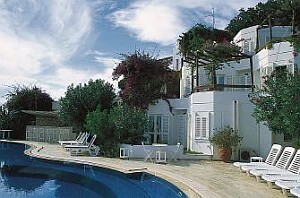 This hotel includes 7 cave houses, 40 rooms dating back to the 5th and 6th centuries and a 19th century Greek Mansion. Yunak Evleri is an inspiring hotel – an ideal base for exploring Cappadocia’s elaborate underground cities, hidden cavernous churches and enchanting rock terrain. Breakfast and dinner (mostly local restaurants, some hotels) daily. All accommodation, sightseeing and entrance fees for sites noted as 'visited' in the detailed itinerary. Gratuities for local guides, drivers, restaurant staff, porters. Domestic flight Antalya-Istanbul. Airport transfers for land & air customers and for early arriving/late departing land & air customers who book their extra hotel nights through us. International airfare to/from the tour. Tour Leader gratuities, lunches, drinks, personal items (phone, laundry, etc), international (if applicable) and domestic air taxes, visa fees, and excursions referenced as 'optional'. Airport transfers for Land Only customers. Our post-reservation trip notes offer further guidance on optional meal costs, shopping, and visas. This tour is offered in spring and fall when temperatures are milder, crowds thinner, and airfares lower than summer. Spring is popular for green landscapes and wildflowers; fall is a time of freshly-harvested local produce. Both spring and early fall will be comfortable, with warm daytime temperatures and cool nights/mornings. Our later fall date may encounter chillier conditions with the possibility of showers, especially to the north. That said, Turkey is still pleasant with temperature not really becoming "cold" until early December. Our land transport is via private air-conditioned motor coach, 36-40 seats depending on ultimate group size (see 'Group Size'). Turkish roads are generally good and travelling is not arduous, though we do have several full-yet-scenic days with stops of interest. The tour is not strenuous but it is busy with lots of moving around and full days of travel and activities. Our tours of towns and cities, as well as archaeological sites, are conducted on foot and feature uneven surfaces and plenty of stairs. Our "level 2" rating reflects the ambitious nature of our program, the considerable amount of walking we'll do, the remoteness of some locations, and the possibility of heat in several locales. Well-located, air-conditioned, mid-range hotels (3-4 star) throughout. All hotels have en suite bath, though some have shower only. Hotel porter service is generally available (see 'Inclusions'). Single rooms are limited and likely smaller than twins. Tour Leader and local guide throughout, driver (s), local step-on local guides in various locales.